Cryptocurrency technology has come a long way. In the last two years, the mass adoption of blockchain technology has become evident. And yet, it lags when it comes to ease of access among the newcomers. The number of exchange and trading platforms in the crypto-ecosystem has considerably increased. Each of these platforms has their own processes, be it registration, compliance requirements or the steps to be followed to convert funds to crypto and vice versa. Also, many altcoin exchanges have overlapping but distinct coin listings. All these things make buying and selling a single coin for the best price on the market a tricky process, leave alone building up a broad and diversified portfolio. Even though cryptocurrency market is easily accessible than the traditional stocks or forex markets, the process of trading can be quite complicated, thanks to poor liquidity and user experience. Such a scenario makes this the right time for a new player to defy the norm. HOLDVEST’s platform offers a unique combination of features that will change the user experience by giving the crypto-investors the essential tools and platform functionality, on par with any professional brokerage site. The single-dashboard interface makes it stand apart from rest of the market players. HOLDVEST — presently running an ICO campaign, is a new kind of blockchain investment platform. The all-in-one platform provides a powerful and user-friendly gateway to the cryptocurrency markets, by enabling its users regardless of the familiarity with the technology, to access blockchain investment opportunities with minimum difficulty. 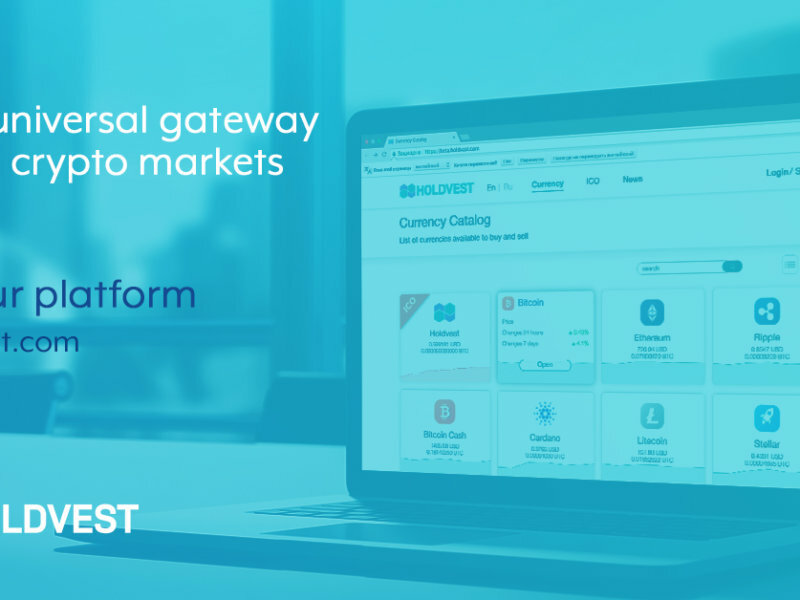 The HOLDVEST platform is designed to change the way crypto-market traders buy, sell, and diversify their portfolios. The new platform, which is currently working in Beta, combines several different features and technologies to make trading crypto and maintaining a winning portfolio, an easier task. In other words, the platform enables users to trade any crypto-asset on any exchange from within a single dashboard. The key building block upon which the HOLDVEST platform offers its user value is its in-built liquidity aggregator. The portal is connected to several major exchanges, giving traders unprecedented opportunity to lock in the best prices. Since every exchange is accessible from this one gateway, the users of the HOLDVEST platform get to enjoy a number of benefits. Some of the advantages include lower fees and a one-time registration. Despite this powerful tech, its user experience is deceptively simple. Users can buy and sell any supported cryptocurrency over its integrated dashboard with one click. The platform also makes it possible for users to withdraw funds directly to an external wallet after a trade occurs, for ultimate security. In addition, HOLDVEST will allow crypto investors to create custom crypto index fund that will make it easy for them to diversify their portfolio, by buying and selling different allocations of many coins in one event, in the same fashion as traditional investors might trade shares in an ETF or index fund of stock. Furthermore, the platform will support new token sales, allow users to invest in ICOs and receive tokens directly to their accounts, and if they wish, they could trade them on the platform’s own decentralized exchange. The user will also be able to launch his or her own ICO, leveraging HOLDVEST’s tech to collect funds and distribute tokens. Monetize the Platform Using the HDL Tokens. HOLDVEST combines the best features of crypto market players. That is, the platform is designed to provide the features typical of crypto exchanges, brokerage sites, and instant trading apps. The platform also offers exceptional security, convenience, and flexibility, making it suitable for experienced traders, institutional investors, and newcomers alike. HOLDVEST currently has a working beta for its platform and is expected to extend and monetize the platform using the HDL tokens, which will be hosted on the Waves blockchain. HDL token will be the fuel that keeps the HOLDVEST ecosystem going. Every activity performed on the platform will require HDL tokens. When a user pays using HDL tokens, they will receive a discount. However, if they prefer to pay in other cryptocurrencies, these funds will be immediately converted to HDL tokens using HOLDVEST’s own liquidity aggregator. To create a constant demand for the HDL token, half of the tokens obtained in this way will be burned, progressively reducing the supply. HDL tokens will be used as trading fees, a fee for ICO listings and voting, paying for adverting space on the portal, and unlocking advanced features on the platform including choosing order parameters, arbitrage, and margin trading, among others. HOLDVEST launched its 5-day pre-ICO on May 8, and it will end on May 12, 2018. During the limited period opportunity, participants can avail a 35% discount on the token price. With a soft cap target of $500,000 and a hard cap of $5 million, the main ICO event will start in June 2018.